This is a traditional treatment choice. 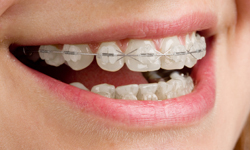 Today’s metal braces are lighter and thinner than the ones you might remember from childhood; as a result they are more comfortable to wear. 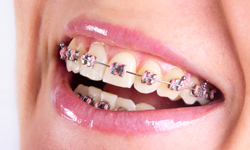 Metal braces are an excellent choice for children of all ages and even adults. This aligner makes use of self-ligating brackets, which gradually adjust themselves as treatment progresses. No steel or plastic ties are used in this system, and this results in less friction and greater comfort for patients. Similar to metal braces in construction, these braces utilize a translucent material that results in a much less noticeable form of treatment. 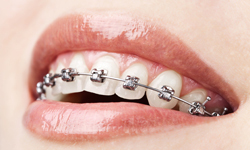 Because these braces can be a little more fragile than metal braces, they are best suited for adults. The innovative Invisalign system utilizes a graduated series of clear acrylic trays that fit closely over the treated teeth. This option is ideal for adult patients who wish to keep their orthodontic treatment a private matter. The trays must be worn at least 22 hours each day, although they can be removed for socializing, eating, and dental hygiene.